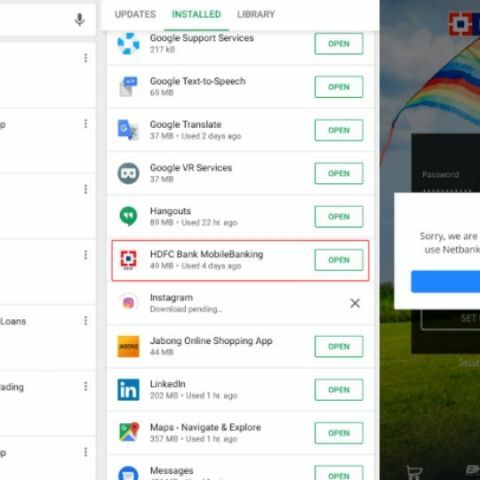 A number of people have complained that they were unable to login to their accounts through the updated HDFC Bank app and were told to use netbanking. Those who had the app installed on their respective devices, and updated it, are currently seeing the new app logo and a refreshed welcome screen. They cannot go further due to glitches in the app. The bank also said that those who never updated the old app can access their accounts through it. 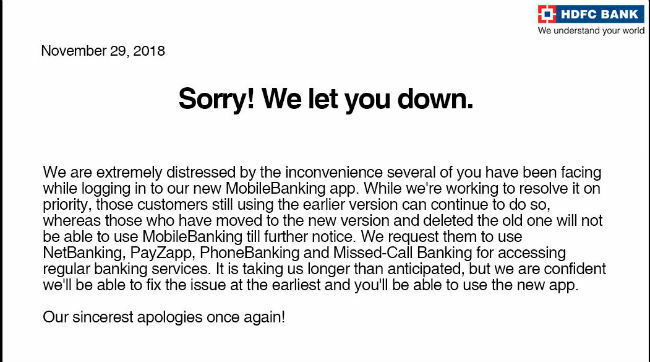 “We are extremely distressed by the inconvenience several of you have been facing while logging in our new MobileBanking app. While we're working to resolve it on priority, those customers still using the earlier version can continue to do so, whereas those who have moved to the version and deleted the old one will not be able to use the MobileBanking till further notice,” the Bank said in a tweet. HDFC Bank has requested its customers to use NetBanking, PayZapp, PhoneBanking and Missed-Call Banking for accessing regular banking services. “It is taking us longer than anticipated, but we are confident we'll be able to fix the issue at the earliest and you'll be able to use the new app. Our sincerest apologies once again,” it added. The bank has about 4.3 crore customers, of which about 6.5 lakh were unable to use the mobile banking app services due to a technical issue in its new app, notes The Economic Times. The bank has also clarified that there has been no data breach or any loss of customer data or security issues with the bank's mobile and net banking apps. Cover Image: The MobileBanking app is missing from the Play Store (Left); the updated app installed on the phone (Centre); and error after we tried to sign-in to the app. how to change kernal version of mobile? use custom roms to change kernel versions . How to prepare my GST return? How to get my Android app reviewed by Digit ? How do I get my pics from my old iphone to my new one?